Simply Modern PE is fairly simple texture pack for Minecraft PE 0.16.0 due to which all elements of the game will become more simplified and modern at the same time. All blocks and items have a slightly modified look and it goes well with modern buildings. 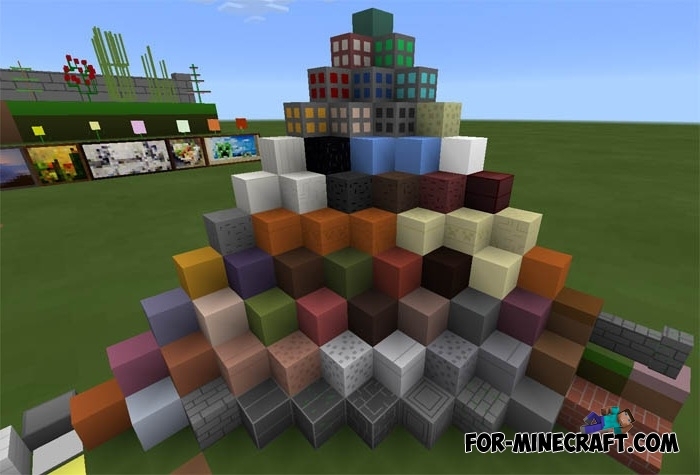 Some blocks have a solid color and it looks like in a cartoon style. Just look at the screenshots and you will understand how the Simply Modern PE Texture pack is different from other similar. Frenden's Meringued Cartoon Texture Pack for MCPE 0.14.0Great cartoon texture pack! Each block, item and mob has its own unique style and design that makes Minecraft into something amazing.